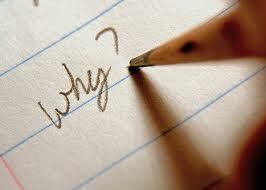 ‘WHY’ is the most debilitating question in Life! The moment you ask that, your peace will be destroyed. And you will just go crazy. For instance, just take the recent events in our world. Why should Malala Yousafzai be shot in her head when all she asked for was her right to an education? Why should an innocent lady girl be gang-raped in New Delhi, and with such beastly brutality that she fights for her Life despite her indomitable will to live? Why should 20 angels perish in a mindless bloodbath in Connecticut? Why should miscreants infiltrate the student crowds protesting peacefully in New Delhi and why should a police constable, who was only doing his duty, have to pay the price with his Life for their unjust, violent behavior? Why do good people have to go through pain and suffering? Why does Life always work in a cycle: extraordinary pain always being a prelude to extraordinary grace and vice versa? WHY? This one simple question really can drive you nuts. Reading an interview The Hindu carried yesterday with music composer, the Maestro, Ilayaraja, I learned something more about the WHY question! Subha J Rao writes of the Master’s humility and wisdom saying, “….the Master musician refuses to take credit for any of his creations. “It just came. I don’t know from where. Questioning the origin of music is like asking why the breeze is soothing, why you shiver in exhilaration when the spray from the waterfall hits you. The day you wonder where it comes from, things get difficult. Sometimes, entire songs are ready in just about five minutes. So, the key to intelligent living is to never ask why __ don’t ask when you are getting the Life you want and don’t ask when you are getting the Life you don’t want. Simply live __ wanting the Life you are getting! The WHY question is also a human question. Look around you. Do you see any other form of creation questioning anything? Everything, everyone, is in a state of acceptance. Except us humans. Which is why suffering is such a unique human condition. Pain is everywhere. When a tree is cut, there is pain that the tree goes through. When there’s a drought, the earth goes through immense pain. But there’s no evidence to suggest that they suffer. Suffering comes ONLY when you ask why you are having to go through pain? Think about it. When you get a migraine or a cancer and you don’t ask why, will you suffer? You will be in enormous physical pain, alright, but you will not suffer. Suffering is born when you ask WHY and you get no reply. Because Life doesn’t give answers. It gives us experiences and allows us to learn from them. So, why look a gift horse in the mouth? Why ask WHY? Author AVIS ViswanathanPosted on December 26, 2012 March 14, 2016 Categories Face Life, Gift, Happiness, http://schemas.google.com/blogger/2008/kind#post, Intelligent Living, Life is Beautiful, Pain, Question, Simplify Life, SufferingLeave a comment on Why ask Why?